Didn't the Old Testament forbid images of God? Many Evangelical churches are purposely barren from visual art to avoid "idols or cast images." (Lev 19:4) but have amazing sound systems to make beautiful music, which is fine with us. We don't think they worship the music anymore than Catholics worship statues. 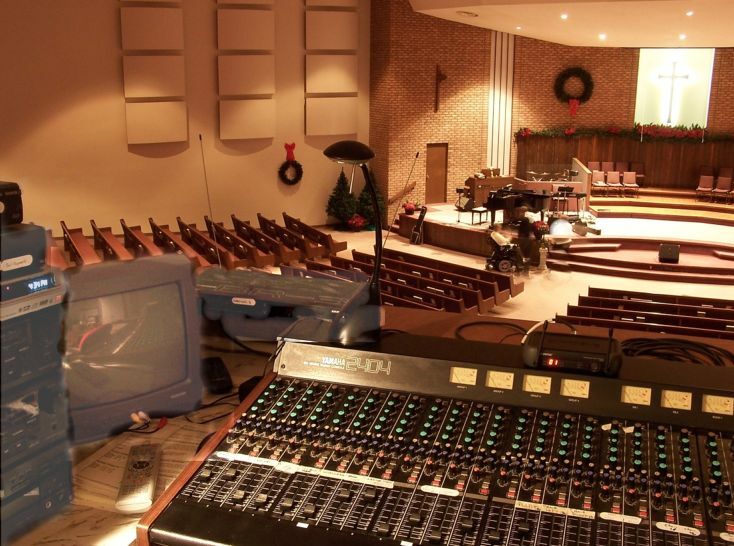 Pentecostal Church (above) with a beautiful $20K Yamaha full grand piano, $40K sound system and $50K accoustic tiles. Many Evangelicals sing with their hands in the air or kneel while singing. If we said, "you are worshipping the music" they would would say they are worshipping through music. The music is a vehicle of expression to bring out an inner feeling - to honour and glorify God. We agree. Many Catholics love singing praise music like Hosanna, Chris Tomlin, Matt Redmond, and Integrity Music with hands in the air. Beautiful art such as a statue or a painting in a Catholic Church is used in the same way Evangelicals use beautiful music (which is also a form of art). We do not worship the art itself as is described in Psalms 97:7. The art is a vehicle of expression to bring out an inner feeling - to honour and glorify God. Catholics worship Jesus through art just as faithful Evangelicals worship through music. This is not exalting foreign gods (Psm 97:7). It is reverencing the One True God. We don't think we should hold disdain for visual art while having such respect for audio art (music). This is a beautiful statue that glorifies Christ. Many Catholics pray in front of it, sometimes with their hands in the air like Evangelicals at an worship music event. 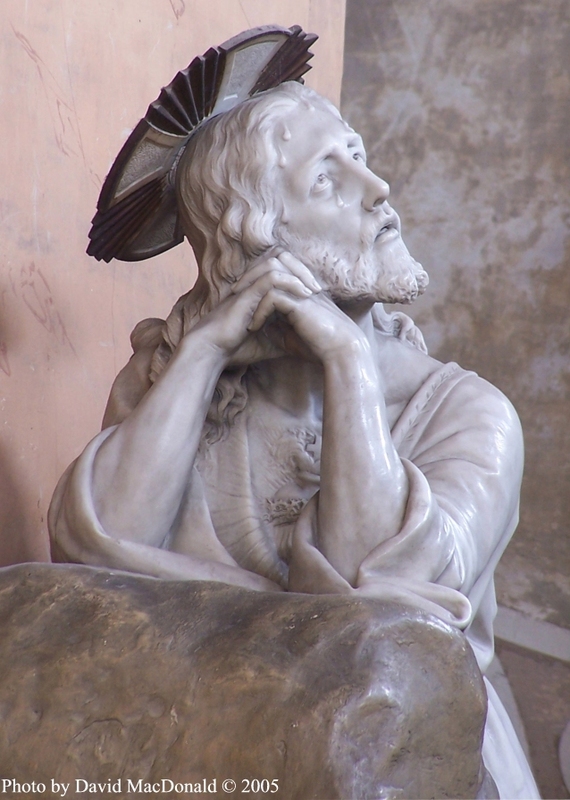 This beautiful Michelangelo statue is not a false god any more than a great Chris Tomlin worship song. 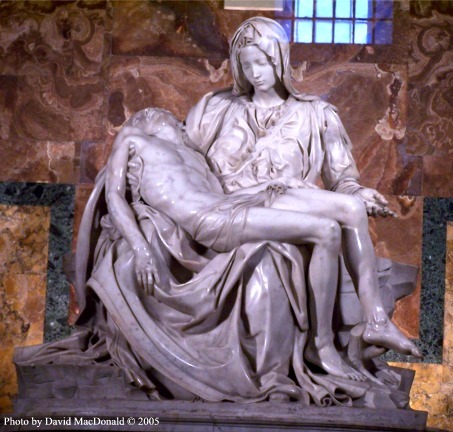 The statue simply reminds us of the beauty of God and the magnitude of his suffering for us. The condemnation of art in the Bible speaks about something quite distinct from what we find in Catholic Churches. Catholics emphatically agree that it is an abomination to create and worship pieces of art that are intended to represent false gods, or that the art is a god itself. Catholics believe neither of these are true in the case of statues and art which simply remind us of the One True God. The statue is just a reminder - like a good "honk if you love Jesus" bumper sticker. "The [Evangelical] Church may have left the arts, God did not. Biblically speaking the Church needs to be a source of creativity ... We left an empty vacuum, we are paying for right now. Christians need to be seen as a creative force that the world sees as 'Hey, if I want to be an artist I'll go to church because that's where creativity thrives.'" We have to be careful not to turn anything into an idol. Matt Redmond, the great evangelical worship leader stopped playing music in his Church for three months because he said that the congregation was worshipping the music and not God, they were idolizing the music. Anything can be an idol if it takes the place of God. For some people money is an idol, for others it is their work, or a beautiful movie star. When a parent receives a letter from their son or daughter who is away in college and is struck with emotion, it is not paper that causes the emotion. The same is true for a photo that a kid in university has of his family. The photo of the parents is just a reminder of the love the kid has for his family. For the first 1600 years of Christianity, most people couldn't read or write. Every stained glass window and statue in medieval Churches told a story. Illiterate people could look at the stained glass pictures on the windows of the Churches and understand the story. So not only were the statues and paintings beautiful and reverent, but they were also very functional. They told the Bible story and the Priest could point to them during his homilies. Statues and stained glass were, for them, teaching tools and reminders. If we walk around any classic sanctuary and we'll see the statues, each saint holding his symbol. A well trained Christian could learn the stories of all those saints, and pass them along to his children, even if he couldn't read. This also explains the classic format of the windows: a large central picture surrounded by a host of smaller vignettes. With proper explanation, one could learn the whole story of, say, John the Baptist, along with all important tie-ins to the life of Christ. These were not false images to be worshiped, but reminders of the story of Salvation. We understand concerns about the "distractions" at Church. Let's think of a visit to a King. Catholics want to worship Jesus with all 5 of their senses not just with music their ears. The most awesome way we worship him is through the taste in communion. Hugh of this site gives part of his testimony. I have no problem with statues is because they were part of a decisive moment in my decision for Jesus. 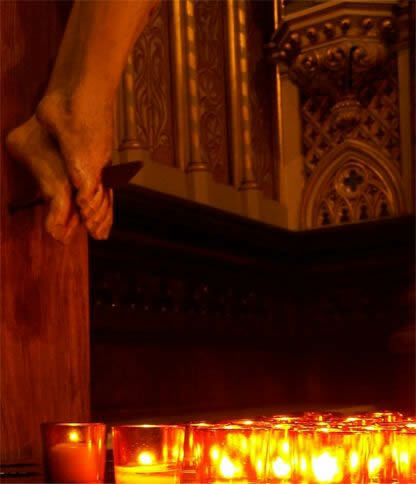 I walked in off the street to St. Joseph's oratorio in Montreal and saw a few elderly women putting their hands on the feet of the statue of Jesus, whispering prayers and humbly walking away with their heads bowed. I was very moved and said to myself, "These women have faith! Maybe the Church isn't a cold stone building full of hypocrites" - which was my attitude before that moment. I did not run over and worship the statue. I went upstairs a lay down in front of the cross and turned my life over to Jesus Christ who saved me. These women witnessed by expressing their faith through art. Here are several Biblical passages where we see statues that are used as a vehicle through which the faithful worship and honour God. We got an email about the quote from Numbers. It said that Judah later destroyed the bronze snake. (2 Kgs 17:4) This actually speaks very loud to the distinction of worshipping Jesus through art and worshipping the art object as a God itself. When Moses created the Snake at God's command he was doing it for the glory of God (Num 21:8). People were healed and brought back to the faith. But later the Israelites started to worship the statue and "made offerings to it." They named it "Nehushtan." (2 Kgs 17:4) Human beings are geniuses at taking something holy and profaning it. Modern contemporary secular music was born out of the Gospel music of the deep south. We don't think that we should outlaw Christian Gospel music just because modern secular artists profaned it by creating sexually explicit R & B out of it. But didn't the Old Testament forbid images of the true God? "making idols of any spirtural thing of god is condemed in the bible. I have not read anything about music or singing being comdemed in the bible "So they are not the same". Anything can be an idol if it takes the place of God. (see above). Most of the quotes in the Old Testament which forbid graven images are talking about images of false foreign gods. In those days the pagans were big on making golden calves and things like that. They would worship the statue itself as a god. (Ex 20:35) These Scripture passages are stressing that there is one God, the true god. It prohibits idolatry, which is the worship of idols and false gods. However, in the early parts of the Old Testament, it is also forbidden to make images of the true God. In Deuteronomy 4:15-18 we read, "Since you saw no form on the day that the Lord spoke to you at Horeb out of the midst of the fire, beware lest you act corruptly by making a graven image for yourselves, in any form of any figure ..."
The important word here is "Since," which is a provisional word. God had not yet visually revealed himself to mankind. However, Catholics believe that God did finally reveal himself visually to mankind in the person of Jesus. "He is the image of the invisible God, the firstborn of all creation"
In the Old Testament it is forbidden to eat pork, but in the New Testament the Lord says that all foods are clean, and he lifts this ban. Likewise, Catholics believe that when God revealed himself to mankind he lifted the ban on making visual representations of him. We think deep down most Evangelicals understand this, otherwise they would not be able to go to any movies that have images of Jesus in them. They would consider movies like "The Nativity" blasphemous. Nor would they be able to have children's illustrated Bibles with pictures of Jesus. The Greek word "icon", means image. Jesus is the visible image of the unseen God. Here's the opening quote on the Vatican's fine art collection. If we replace the word "art" with "music" in the above statement, I'm sure the Evangelical music industry would say "ditto." In Greek, iconoclasm means "image breaker". This heresy, like its name suggests, has a paranoid fear and rejection of the use of images or icons in religion. Although present throughout the Church's history, the most infamous period of iconoclasm occurred in the eighth century. Because of the Islamic incursion in North Africa and Asia minor during this period of history, Emperor Leo III and iconoclastic Eastern bishops sought to sanitize the Faith of images which were offensive to Muslim eyes. In so doing, they believed that conversions to Christianity might be more likely. Through the reigns of Leo III, Constantine V, and Leo IV, iconoclasm was ruthlessly enforced by the systematic destruction of icons, statues, and sacred images. Not until the Second Nicean Council in 787 A.D., some 60 years later, was the ancient Catholic tradition restored and a distinction made between adoration ("latria") and veneration ("dulia"). 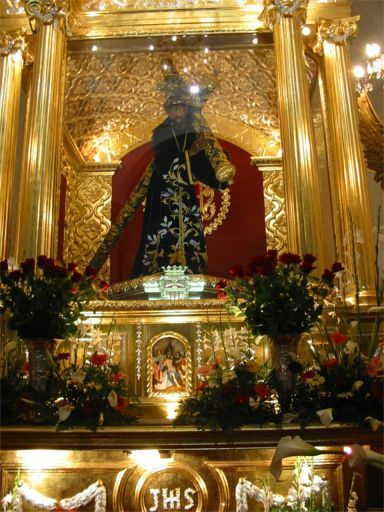 The Council re-affirmed the constant custom of venerating religious images and icons while at the same time renouncing "icon worship". Biblical evidence for the Church's position can be found in these passages: Exodus 25:18-22, Exodus 28:33-34, Exodus 37:7-9, Numbers 21:8-9, 1 Kings 6:23-28 1 Kings 7:23-29, 2 Chronicles ch. 3-5. Most Evangelical Churches today have a heightened aversion to the use of sacred pictures or objects in their worship services. They usually have plastic trees, and plants scattered around the front of the Church where Catholics would have statues. Unfortunately, the attitude they assumed, ironically enough, is from Islam. Other contemporary organizations that are iconoclasts include the Mormons and Jehovah's Witnesses. So in summary, Catholics should keep sharing their art with the public and Evangelicals should keep making their music. Also the Catholics should try to make better music for the Lord and the Evangelicals should get a little more visual art. Sometimes even Sunday morning's can get stiff and stale in Evangelical Churches.